Which consumer goods giant makes a better investment? Starbucks (NASDAQ:SBUX) and Pepsico (NASDAQ:PEP) are both standard-setters when it comes to beverages and -- in PepsiCo's case -- food. While they each approach sales, marketing, and distribution in different ways, each has carved out enduring business for their products. But which consumer goods giant is a better buy? To examine each stock's investment potential, lets put them up against each other to see which one comes out on top. Starbucks is undoubtedly the faster-growing company of the two. Over the past five years, Starbucks has averaged annual EPS growth of 24%, while Pepsi has actually averaged an annual decline in EPS of 1.3%. What about more recent EPS growth? A look at Starbucks' EPS decline in the trailing-12-month period stated in the chart above may raise some eyebrows. Starbucks' first-quarter EPS plummeted 29% in Q1, weighing on Starbucks' reported full-year earnings. But investors should know that this decline in EPS in Starbuck's most recent quarter is entirely attributable to an unfavorable comparison of a one-time gain from an acquisition of a joint venture recognized in the year-ago quarter. When excluding this one-time event, Starbucks' non-GAAP first-quarter EPS actually increased 15%. Overall, therefore, Starbucks is growing rapidly -- in terms of both sales and profitability. PepsiCo's revenue growth, on the other hand, has come to a halt, essentially going nowhere during the last five years. Notably, however, when adjusting for the impacts of unfavorable foreign exchange impacts, the company does continue to grow slightly. PepsiCo's trailing-12-month revenue was actually up 5% in constant currency. PepsiCo's reported GAAP decline in revenue in the trailing-12-month period also doesn't accurately represent the state of the company's core business. In constant currency, PepsiCo's core EPS was actually up 10% during the past year. Pepsi, therefore, is still a growing business -- albeit not as rapidly as Starbucks. 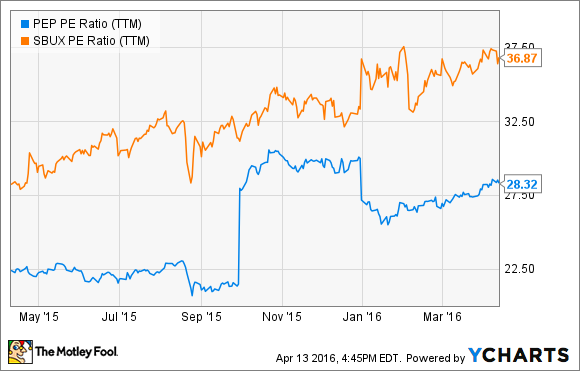 Of the two stocks, PepsiCo unsurprisingly trades with a lower price-to-earnings ratio of 28. But Starbucks' P/E ratio of 37 isn't much worse. PEP P/E Ratio (TTM) data by YCharts. The difference in their valuations, however, looks greater when you consider that PepsiCo trades at 19 times free cash flow while Starbucks trades at a much higher 34 times free cash flow. The question, therefore, is whether or not Starbucks' faster growth makes up for its comparatively outsized valuation? The deciding factor of which stock is a better buy may boil down to a 10,000-foot view of the two companies' average annualized EPS rates during the last five years. Starbucks' average annualized EPS growth of 24% is a true testament to the company's ability to innovate and drive growth over a meaningful chunk of time -- and it's far ahead of Pepsi's average 1.3% annual decline in EPS during this same period. Even if this entire period were adjusted to reflect Pepsi's currency headwinds, this huge difference in their EPS growth over the past five years makes it no contest. If I had to put my money on either Starbucks or PepsiCo today, I'd go with Starbucks.